Unlike regular photographic lenses, macro enlarging lenses have no fixed flange-to-image distances. Cameras also vary in their back-focal lengths. 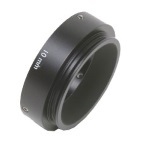 So, macro enlarging lenses are combined with extension tubes according to the requirements of each installation. Unlike typical machine vision lenses, Schneider macro enlarging lenses can accommodate a large range of flange-to-image distances while still delivering excellent image quality.